Locally owned and established in 1970, Michael Smith Excavating & Septic Systems has been providing our services to Middlesex County, NJ, Monmouth County, NJ, Mercer County, NJ and the surrounding areas for over 40 years! We provide installation and repair service for septic systems, as well as excavation for residential or commercial businesses. Your septic system isn’t something to take lightly. Even the smallest problem could have big consequences, which is why it pays to trust experienced professionals with its care and maintenance. When you need work done or a comprehensive septic system inspection in Middlesex County, NJ, Monmouth County, NJ or Mercer County, NJ trust none other than Michael Smith Excavating & Septic Systems for a thorough, experienced approach and a job well done. No matter what your system needs or the scope of the job, we’re on hand to provide the services you need to keep it in full, proper working order. From the design to the installation, maintenance and beyond, we’re your complete resource for septic work. We’ve been a locally-owned and –operated business since 1970! We offer free estimates to all potential customers! We specialize in all forms of septic system installation, maintenance and repairs. If you require septic services, contact us today for information about our abilities and for a free quote. We’re happy to provide you with upfront information to ensure you’re getting what you need. "I have no hesitation in recommending Michael Smith for septic tank repairs. 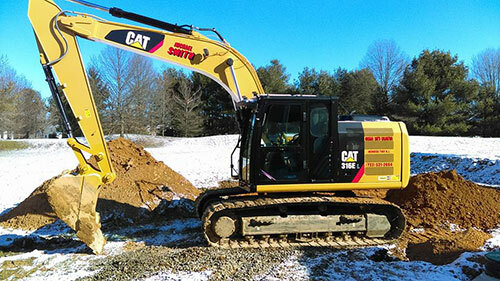 The Smith organization arrived on time when scheduled and they d..."
"Highly recommend the services of Michael Smith Excavating & Septic Services. We loved the way we were treated by Michael and his crew and th..."
"Nicely executed. I like the way you took the consumers point of view while explaining the qualities of the business." "Had major problem locating cleanout tank to pump out. Michael Smith guys came here yesterday and diligently worked with probs until they loc..."